Election of the AIA International Region Secretary 2019-2020. The AIA International Region (AIA IR) is the nineteenth Region of the Institute. It is approximately the same size as nine others and considerably larger than at least three others. The AIA IR is still growing, while many other regions are shrinking. There are currently 2,387 verified members with 300-600 additional lapsed/potential members. Last year the AIA IR transitioned from a zone-based organisation to representational Board seats. Each International Region Component Chapter has a representative on the AIA IR Board. Etain Fitzpatrick, AIA is the AIA UK’s 2017-2018 Chapter Representative. The full list of AIA IR Chapter Representatives can be found here. President, Thierry Paret highlighted some of the main goals and initiatives of the AIA IR. He emphasized that the AIA IR Board is the voice of its members to the AIA and noted the importance of representing the interests of overseas members as the Institute examines its governance structure. The AIA IR encourages global growth of the AIA through the establishment of new off-shore chapters. The latest International Region Chapter established was AIA Canada. The AIA IR also connects global unassigned members, who do not have chapter representation, with the AIA. The AIA IR educates through symposia and conferences and promotes excellence in design through its annual design awards program. Last year’s AIA International Region’s Conference was held jointly with AIA Continental Europe in Prague last October 2017. The AIA International Region’s 4th Annual Design Awards ceremony were held on October 7, 2017 at Lobkowicz Palace, Prague Castle, Prague, Czech Republic. The winning projects were also exhibited at the Rizzoli Bookstore from 21st-23 June during the A’18. The AIA International Region Design Award 2018 submission deadline is August 25th 2018. The 2018 AIA International Region Conference will be held in Singapore from Nov 2-4, with an optional 3 day extension to Bali. Speakers to include Jamie Von Klemperer, FAIA, President & Design Principal at Kohn Pedersen Fox Associates and Illya Azoroff, AIA, founding principal +LAB architect PLLC & Associate Professor, New York City College of Technology (CUNY), a leader in disaster mitigation, resilient planning strategies and design. Advance the proposal to retain a strategic growth consultant—understand trends such as where our future members are coming from. Revision of by-laws to include the addition of an AIA Assoc. position to IR Board. Explore the possibility of having part time administrative staff, currently the AIA IR has no paid staff. The AIA International Region has monthly conference calls with the AIA International Practice Committee Advisory Group (IPCAG). The IPCAG serves U.S. based AIA members with international practice matters, while the AIA IR serves AIA members living outside of the U.S. The IPCAG have produced the AIA Global Practice Primer to guide architects who are pursuing projects abroad or are already engaged in international work. The primer features a ‘wealth of first-hand knowledge and expertise on international projects.’ Bea Sennewald, AIA is one of the members of this this group. Bea is long-standing member of the AIA UK Board and 2006 Chapter President. Loay Quota, AIA, AIA IR’s Treasurer, presented an analysis of the 2017 revenues and expenditures and the 2018 projected expenditures. 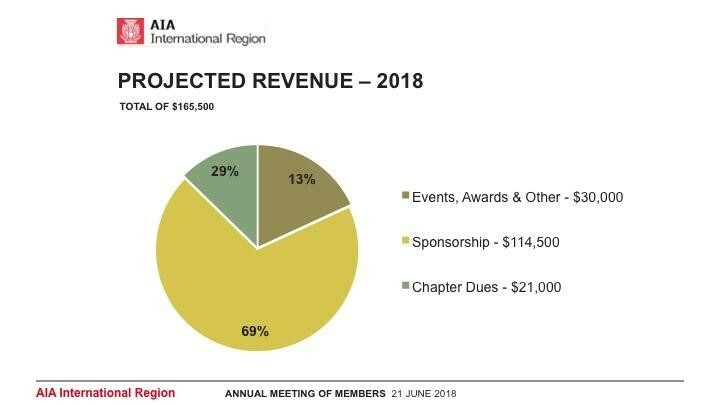 Most of the AIA IR’s revenue comes from sponsorship and most the region’s expenditure is on the events and awards program. The travel expenditure for 2018 has been increased from the 2017 budget. 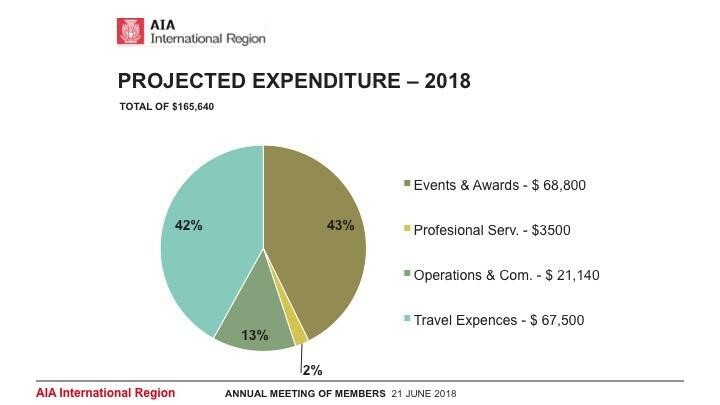 The AIA IR’s expenditure’s continues to outweigh the revenue. So, the region’s goal over the coming year is to increase revenue through expanding attendance to conferences, events and participation in the award’s program and continuing collaboration with sponsors. The AIA IR held it’s election for the position for AIA IR Secretary, 2019-2020. Greg Yager, AIA, from AIA Shanghai, was the uncontested candidate. Therefore, in this instance voting was a formality, however, votes must still be processed, followed by an official announcement. The AIA IR would like to encourage more member participation for AIA IR Board Director positions in the future. Each of the seven International Region chapters gave a summary report of their chapter’s activities over the past year. Alex Miller, AIA, AIA UK’s Chapter President presented the AIA UK’s Chapter 2017/2018 events. The AIA UK has a strong events program that always receives admiration from our international colleagues. It was inspiring to hear the each of the chapter’s events, initiatives and challenges. There were many interesting ideas, some of which we could help influence the AIA UK’s events program moving forward.